Whenever I travel, I find myself inundated with requests to rent a car. Every time I purchase a plane ticket, or reserve a hotel room or visit a tourism website I’m asked if I want to rent a car from a certain provider at a discounted rate, and its never seems to be my preferred car rental agency. Then when I go to my preferred car rental website, I don’t see that rate offered at that destination, or the car I wanted. I keep feel like I’m missing out! Why can’t I just go to one place and find it all again and get the best deal possible? This is the frustration the Discount USA Car Rental app has been designed to solve. They have the same discounted rates offered up to all airlines and hotels through their site for all the rental agencies in one place. This allows you to see the best deals and allows you see the best deals available where you are going. 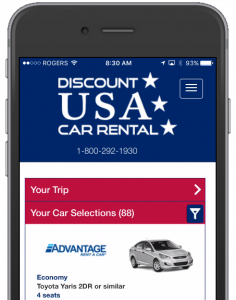 This app, developed by 14 Oranges for Discount USA Car Rental joins the world of “on demand” apps also discussed as being part of the “Uberfication of everything” trend. It’s the idea that consumers what to a single place to go and find the rock-bottom best price for good service, and it should be turnkey and as frictionless as possible. Package deals for hotels, airlines and car rental agencies made sense at one point because of the literal friction involved in making bookings in the 70s and 80s. There was friction on your fingers while you leafed through paper catalogs filled with star rated hotels at travel agencies. There was friction from squirming in an uncomfortable chair at the travel agent while they booked your airline ticket through a 900 baud connected reservation computer. Then, after an hour sitting in the stale coffee infused travel office in rayon pants, a self-inflicted form of friction mind you, if the package offered you an orange Ford Tempo with roll-down windows as your air conditioning option, you took it just to get out. Now with hotel and airline reservations literally available within seconds through on-demand discount airline and hotel apps, it makes sense to have a standalone rental app that also gives you the best deal without any of the packaged entanglements. Because nobody wants revisit trauma caused by that family trip to the Florida Everglades in that orange Ford Tempo with no AC!